Usually when I dressed up to go out with my mates as a teenager. But we’d never see eye-to-eye. Because I had one view of what I looked like (cool, moody, lady-killer, Rockstar, legend in the making). And my mum had another view (ludicrous, embarrassing, what will the neighbours think?). It’s been proven by boffins that we don’t really appreciate how we look like to others. Not only that, as you’re about to discover, the photos we THINK make us look our best, are not the ones that others think look best. In fact, quite the opposite – we often present our worst image in public. This might not be a serious issue for your average casual Facebook or Instagram user… but it could be when it comes to online business. At some point you may need to put up a photo of yourself that represents your business, products and services… your message and values. That image could be on Social Media, on websites, “About Me” pages”, book covers, interviews and blog posts. In an online world where attention spans are short and visitors make snap judgements within seconds, the photo you choose can make a difference. In a 2014 study in the Journal of Neuroscience, it was shown that the brain will immediately determine how trustworthy a face is before it’s been fully perceived. So even before someone has consciously thought about your photo, they’ve made an instinctive judgement on how trustworthy and likeable you are. The reason I bring this up today is that I was talking with someone who wanted to create a banner for her new online business – something to go on the website and at the top of her email newsletter. There was a photo she hated… her in a white shirt, laughing, in an informal pose. And one she liked – her in a black top, arms folded, smiling. I felt that the best photo was the one she hated. It was friendlier, more approachable and warm. Everyone else we spoke to preferred that one as well. So what’s going on here? Do we really have such distorted views of ourselves? They gathered a load of profile photos and asked the people from the photos which ones they’d use for their Facebook, LinkedIn, and dating apps. They were then asked to do the same for everyone else’s photos. The study found that what people chose for themselves was very different from what was chosen by the group of strangers as a whole… and what they rated as “attractive” or “trustworthy” in their own photos, wasn’t the same as the majority opinion. The best way to pick a photo to represent you in business is not to trust your own judgement, but to let others decide. One method is to take a selection of profile photos and share it with a largish group of people you know. Ask them which photo they find most appealing. Then use the above checklist to break it down a bit. For instance, you might be most concerned about conveying ‘confidence’ in your image – so that might the element that swings your final decision… or it could be ‘trustworthiness’. It depends on the personality and brand of your business. If you’re on Facebook, perhaps set up a private Facebook group and invite some contacts to it, explaining that you’re doing this for important business reasons and you’d appreciate their input. But if that’s too awkward or embarrassing, try a service like this one. This allows you to post a profile picture, then get feedback from other anonymous users of the site. The advantage is that you’re getting unbiased opinions from people who have no preconceptions about you. You get votes on your photo by voting on other people’s photos. There is a freebie version available but highly limited, so try it out then maybe opt to spend money to get a large enough number of votes to make a decision. 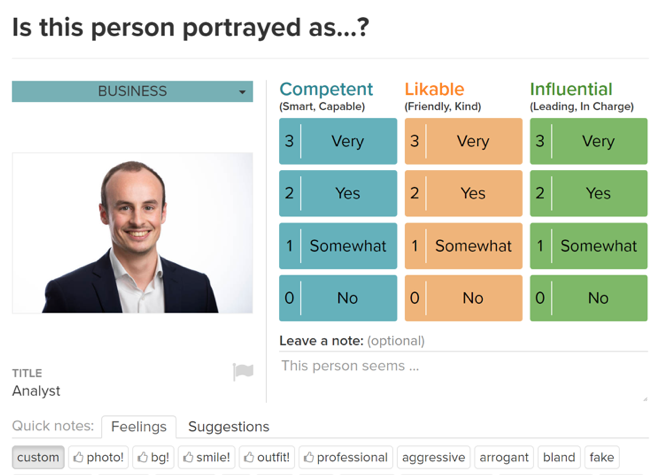 A simpler option is this service called Snappr – view website, which analyses your LinkedIn profile photo. As LinkedIn is aimed more at the business-to-business and professional market, this could be valuable for analysing your business phot. You could also try this one: Look See – view website, however this is aimed more at the dating market. Remember, people coming to your website or social media don’t know the real you. For those first few milliseconds they will judge you purely on that photo, so it’s important. Bearing in mind that you might use the same photo for a good few years, and that thousands of people might see it on your emails, your website and social media… it could be worth that little extra effort to pick the best one. The key is to trust in the thinking of people who don’t know you (and don’t have a bias) rather than assuming you know best. The same goes for non-business usage… if results are important to you (for instance a photo for a dating website) then use friends, colleagues or a service like Photofeeler, Snappr or Look See.